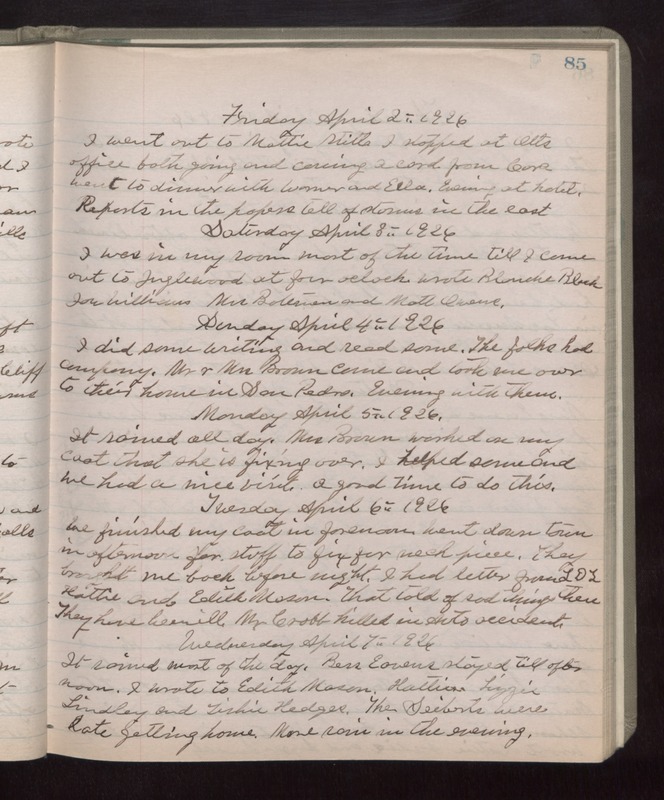 Friday April 2nd 1926 I went out to Mattie Stitts. I stopped at Otts office both going and coming. A card from Cora. Went to diner with Warner and Ella. Evening at hotel. Reports in the papers tell of storms in the east. Saturday April 3rd 1926 I was in my room most of the time till I came out to Inglewood at four oclock. Wrote Blanche Black, Joe Williams, Mrs Bateman and Matt Owens. Sunday April 4th 1926 I did some writing and read some. The folks had company. Mr & Mrs Brown came and took me over to their home in San Pablo. Evening with them. Monday April 5th 1926 It rained all day. Mrs Brown worked on my coat that she is fixing over. I helped some and we had a nice visit. A good time to do this. Tuesday April 6th 1926 We finished my coat in forenoon. Went down town in afternoon for stuff to fix for neck piece. They brought me back before night. I had letter from L D L, Hattie and Edith Mason. That told of sad things there. They have been ill. Mr Crabb killed in Auto accident. Wednesday April 7th 1926 It rained most of the day. Bess Eavens stayed till after noon. I wrote to Edith Mason, Hattie, Lizzie Lindley and Tishie Hedges. The Seiberts were late getting home. More rain in the evening.